The weather is heating up, and the time has come to spruce up rental properties. The basic gear you need for a safe DIY paint job are: gloves, safety glasses or goggles, a dust-mask for sanding, and sensible shoes with a good grip. Skin protection:Wear the appropriate gloves: cloth or leather gloves for sanding and scraping, impermeable gloves for applying water-based paint, solvent-resistant chemical gloves for handling solvent-based products. Eye protection:Use eye goggles or glasses, or a face mask. Lung Protection:Wear an anti-dust mask whilst sanding a surface or a solvent-respirator if working with solvent-based products. Ensure good ventilation with open windows and doors. Handling Solvent-based ProductsAll organic-based solvents ” including white spirit, solvent-based paints, solvent-based thinners and primers, solvent-based wood treatment products as well as paint strippers ” represent potential health hazards, and require that particular precaution be taken both in use and in storage. Read the label carefully for information on safety and health-related issues. Solvents are highly flammable ” keep these paints away from all sources of heat, and never expose directly to an open flame. Store in cool, well-ventilated areas. Keep these products out of reach of pets and children. Dispose of rags properly ” rags soaked with oil-based materials can ignite spontaneously if not spread out to dry. Keep children and pets out of the painted area. 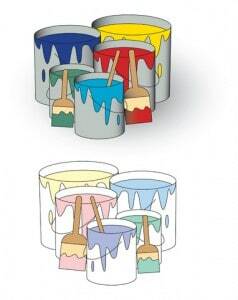 To a large extent, water-based paints pose fewer risks and health hazards than solvent phase paints. Modern, high quality water-based paints offer an excellent performance profile ” superior durability and colour retention, excellent washability, for example. They are also more convenient to use ” low in odour, they dry quickly, and brushes can be cleaned with warm, soapy water, with no need for white spirit or turpentine. And of course they are more environmentally-friendly. Using Step-Ladders Safely Step ladders are very often both a central part of a paint job, but also a key danger area. Take time to check the condition of the ladder both before and after use. Check that the ladder is sufficiently robust to support your weight. Make sure the steps are free of oil, wet paint, mud, or any other potentially slippery substance. Clear the area around the ladder from any clutter. Make sure that no electrical cords or wire leads are close. If the ladder needs to be in front of a door, consider locking the door to prevent surprise openings. If the ladder is in a high-traffic area, draw attention to this fact in the house ” a hand-written sign would do. Make sure the floor is even and stable. Avoid wet or slippery surfaces. Wear suitable shoes ” no heels, barefoot is not good, nor are most sandals. Never climb onto wet or slippery steps, make sure they are dry. Never overstretch ” do not climb beyond the last three steps of a ladder. Keep your shoulders between the rails and don’t over-reach ” move the ladder instead. Always keep 3 point contact with the ladder. If your ceilings are high, but your ladder too small, don’t try to overreach yourself ” renting or borrowing a suitable ladder is much safer. Don’t let your children climb up the ladder: prevent access at the end of the day if you have to, or fold it up after use. Be prepared for an unforeseen vertigo attack “ don’t look down, breath slowly and steadily, and go back down step by step. For more information on paint and remodeling with paint, visit www.paintquality.com.